Note: This EMOM station rotation comes from a training session conducted on Saturday with Greg Amundson and Mark Divine at SEALFIT. This is a demanding session, especially the Kettlebell and Pull-up stations. Athletes can choose their start station but must honor the order of rotation. Tiffany is Athlete Of The Week! Congratulations to Tiffany who was recognized as Athlete Of The Week at CrossFit Amundson. 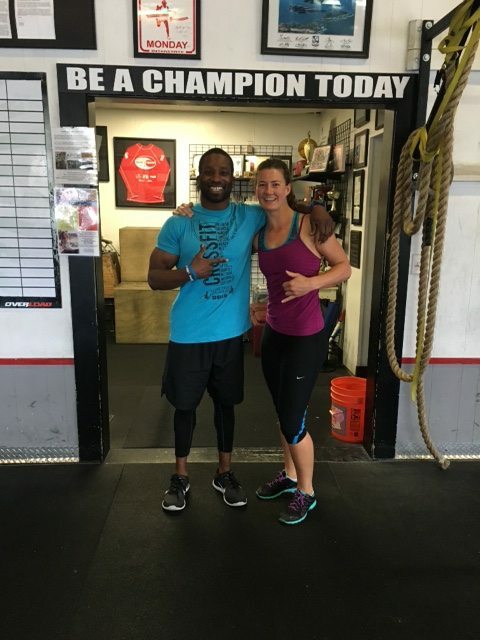 Tiffany is one of the top female Athletes at our gym, and it seems she continues to improve with every training session. When Tiffany first joined our gym, her gymnastic strength was amazing, due largely to her climbing experience. Today, her gymnastics has continued to dominate in workouts, but now her weightlifting is stellar as well! Tiffany has been diligent with her Olympic lifting, and her Power Clean is a thing of beauty. Tiffany is also a great example of “Fitness Outside The Box” with her incredible sense of adventure, she leads the way with hiking, mountain biking, and now surfing! Tiffany is also a great example of patience and self-love. Following a serious mountain biking accident, Tiffany rehabilitated herself back to top performance shape, and inspired everyone who knows her along the way. Keep up the inspiring work Tiffany, we love you sister! Today our LIGHT workout will be our HQ programming at either HQ or Krav Maga.